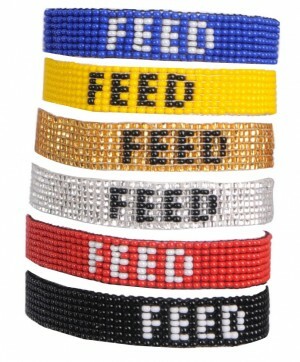 DALLAS, Dec 9, 2010 / FW/ — Being sold exclusively at Forever 21, the FEED 2 Bracelets will provide 2 school meals for children through the United Nations World Food Program. Available in 6 different colors which represent six different countries, the FEED 2 bracelets are hand-beaded by artisans in Guatemala. Measuring approximately 6” long, with 3″ ties on both ends, these charming glass-beaded nylon-strung bracelets comes in red, yellow, blue, gold, silver, and black. RED: Provides 2 school meals in Swaziland, a country with the highest HIV prevalence in the world. YELLOW: Provides 2 school meals in Sri Lanka, aiding millions of citizens still struggling with the effects of 2004’s devastating tsunami, coupled with a quarter century of civil war. BLUE: Provides 2 school meals in Haiti, a country in which approximately 70% of children under 5 years old suffer from malnutrition. GOLD: Provides 2 school meals in Honduras, which houses the third largest School Feeding Operation in the world. SILVER: Provides 2 school meals in Pakistan to aid victims of the recent flood and earthquake that devastated millions Pakistani children. BLACK: Provides 2 school meals in Kenya, benefiting over one million children within the U.N. World Food Program’s School Feeding Operations in Kenya. Mix and match with other bracelets, and trade with your friends this holiday season!